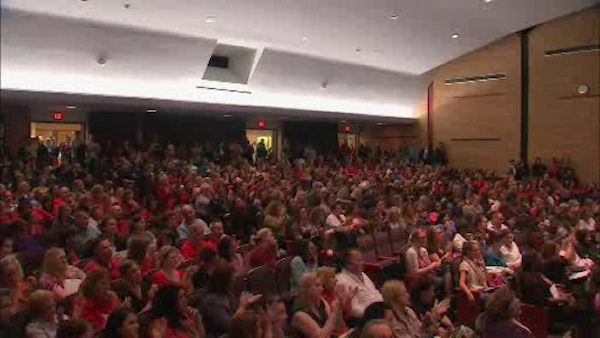 LAKE RONKONKOMA, N.Y. (WABC) -- A meeting was held Wednesday night about shutting down some schools on Long Island. Sachem School District, one of the largest in the state, could close as many as four schools. "I'm not a happy mom," said Barbara Kovacic, a mother. Kovacic says she's had a difficult time explaining to her 2nd grade son why his school district is considering closing up to four schools. One of them could be his school, Gatelot Avenue School. "My son is physically challenged. He's got a handicap and this school is great for him. If they close it down he's going to be heartbroken," Kovacic said. The Sachem School District is in dire financial straits. It's more than a million dollars in the red, money that's needed right now for the special education department. Administrators say couple that with declining enrollment across the school district and that's why they have to close some schools. "I really do not know what they're going to do. I just hope that whatever they do it's going to be the best for the kids," said Kenny Fieschel, a father. Administrators are considering a variety of options which include closing one middle school, two middle schools, one middle school and two elementary schools or closing four of the district's 12 elementary schools. It may mean Tara Mattimore's son could end up in middle school as a 5th grader. "I do not really want it to happen, but we're in a mess. This is what they're going to decide tonight," Mattimore said. The Superintendent James Nolan told Eyewitness News, "Our declining enrollment combined with financial challenges brings us to these discussions on optimal use of our facilities." They expect to make a decision within the next two months.